Here are few more presents I have made. These two were crocheted. I used this pattern but just used one color instead of the many it does. 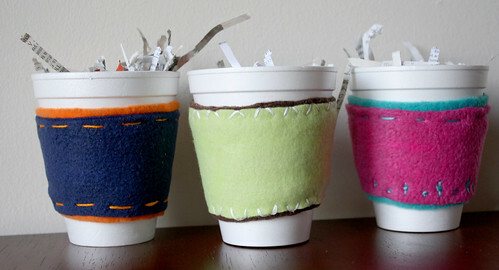 For the rest, I just made my own pattern from a cardboard coffee sleeve from a coffee place. I made the pattern longer though, because I used velcro to keep them closed. They are two layers of fleece with hand embroidery. I sewed the ends with a sewing machine for extra strength. Those are awesome. I think I’m going to have to make some today! I love the crocheted ones, they’re adorable! What a great gift for coffee drinkers. My mom would love one! 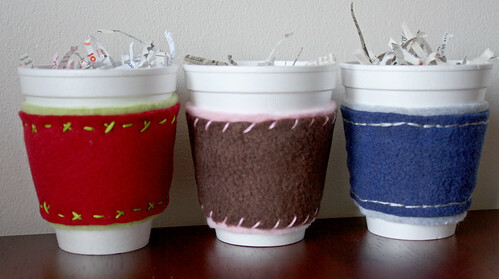 I’m not a coffee drinker, but if I was, I’d be snatching up this idea for my coffee cozy! These are cute! I made one for my sister this year from fabric but a crocheted one would be super cute! I have thought about doing some of these lately. Yours are so cute, I definitely have to now. 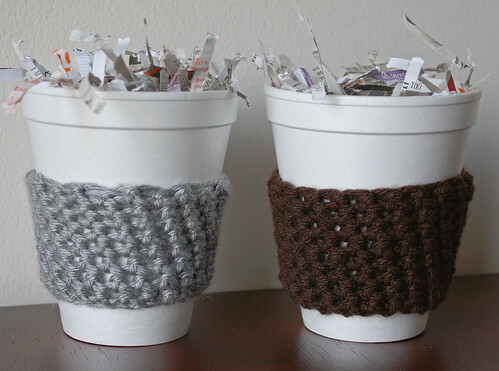 Those cup “warmers” are really awesome. I drink my latte out of a glas- and YES, i do burn my fingers every morning. Think I gotta sew some of those today!